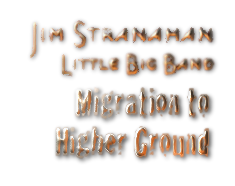 A big band and a smaller ensemble that sounds like a big band are the backdrops for Migration to Higher Ground (Tapestry Records, 2014) by the Jim Stranahan Little Big Band. The versatile reed instrument player and composer surrounds himself with top Colorado musicians. Two ensembles are used in this set, recorded in two sessions. For five songs, Stranahan plays alto and soprano saxes, saxophone cadenza, and on “Mambo Facil,” soprano and tenor saxes. Other players are Caleb Starbuck, alto sax; Joe Anderies, alto flute and tenor sax; Chuck Schneider, tenor sax; Brad Goode, lead and jazz trumpet; Hugh Ragin, jazz trumpet; Wade Sander, trombone; Ben Faust, sousaphone on “Bayou Bounce”; Justin Adams, piano; Bijoux Barbosa, bass; and Todd Reid, drums. That session was recorded live in the performance studio of KUVO (Colorado Public Radio) during a broadcast. 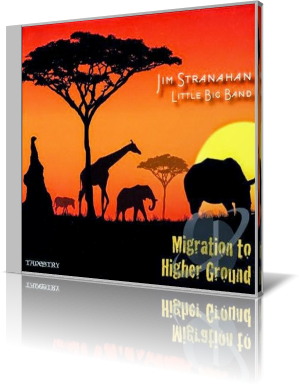 On the four tracks, Stranahan plays soprano, alto and tenor saxophones. This group consists of Good, trumpets; Sander, trombones; Glen Zaleski, piano; Rick Rosato, bass; and Jim’s son, Colin Stranahan, drums. The set begins with one of Stranahan’s originals, “Mambo Facil.” After a blazing big band opening, things go still and quiet – briefly. Then the mambo kicks in with the rhythm section bringing things up. The blended horns then take point, weaving in and out, overlapping phrases and working well as a unit. Stranahan stretches out on the tenor during the middle break, followed by Anderies with a sunny flute solo, one of the trumpets and Adams. The mood of the song is that of a bullfight, beginning with the matador’s entrance and then the battle. The changes in the song represent shifts in momentum. “Paul and Dave” is Stranahan’s tribute to Paul Desmond and Dave Brubeck. Abbott’s guitar is featured more prominently. Muted horns blend with unmuted horns. It’s a peaceful yet moving selection, highlighted by Reid’s stick work and Barbosa’s bass line and a series of solos, including flute, trumpet, two saxophones and guitar. Stranahan composed six tracks, and arranged covers of songs by Brubeck, Sonny Rollins and Charlie Parker. The Denver-based educator and bandleader has performed with such notables as Bob Hope, Rosemary Clooney and many others.